Our pick of this week’s arts, design, film and music events from a very busy Liverpool – and loads of it’s free! Catch a guided tour today of the Museum’s Tales From The City exhibition, which highlights a LGBT+ history specific to Liverpool. A response to the 50th anniversary of the 1967 Sexual Offences Act, expect harrowing stories of struggle and protest from that time, as well as more joyful experiences of equal rights in action, told through film, costume, art, photography and interviews. 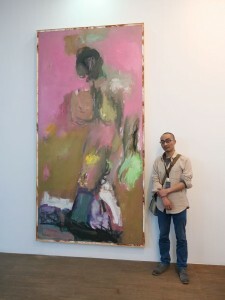 If you’ve been to the John Moores Painting Prize, you’ll know that there’s a parallel China edition, and today you can meet in person the five prize-winners: Zhong Xueqing (below), Pan Lin, Duan Xiaogang, Huo Xumin and Wang Yi. Expect a personal take on their individual (and very colourful) works, with an introduction from Dr Hana Leaper, John Moores Painting Prize Senior Lecturer, LJMU. Could it be that one of our favourite writers, Deborah Levy, is coming to Liverpool to speak about one of our favourite recent exhibitions, Francesca Woodman? Yep, that’s right: hear the twice-Man Booker Prize-shortlisted author of The Cost of Living discuss writing and womanhood, and the impact that the young female artist, Woodman, has had on her work. To accompany her new Biennial exhibition, multi-award winning filmmaker/artist/photographer Agnès Varda has devised a special film programme of her favourite films (by her and others) – to screen every Wednesday until October. And at 90 years of age, she has had a huge oeuvre to choose from. Tonight, expect an electric analysis of a rocky marriage in her 1955 debut La Pointe Courte (below), and understand why Varda is considered to be a pioneer of the French New Wave. You might know her as Director of Auto Italia, London, but artist Kate Cooper was born in Knowsley. Tonight, her first solo exhibition in the city comes about at Output Gallery’s invitation – a new venue showing creatives exclusively from or living in Merseyside. Expect Cooper’s spectacular use of CGI (top image) to takeover this small space: unsettling avatars in surreal situations. Don’t miss Cooper in conversation on 26 July, 6.30-7pm. It’s a night of premieres by Immix Ensemble and Liverpool Biennial! In the Grade-listed venue’s impressive Civil Court, expect Bold by Name, Bold by Nature to draw on “the joy and the dis-chord” of the city – created by Liverpool-based vocalist and songwriter Jennifer John, and Manchester-based guitarist and composer, Stuart McCallum – supported by new works by Immix’s composer-in-residence, Andrew PM Hunt, and artistic director Daniel Thorne. Biennial artist Taus Makhacheva has created – why not? – an art spa for this year’s festival, inspired by ASMR (Autonomous Sensory Meridian Response). Each one-to-one, 30-minute session includes a real facial whilst you lie on a huge sculpture (above), and are told (whispered) stories about artworks that have disappeared throughout history. 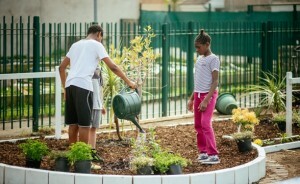 A community garden in the heart of Toxteth (below), tended to by children and residents of the area, and designed by Biennial artist Mohamed Bourouissa, today you can ‘dig in’ and learn more about this and – importantly – the area’s long history with guerrilla-style planting. Inspired by an occupational therapy garden in Blida, Algeria, discuss the artist’s vision with Biennial’s Education Curator Polly Brannan at 3pm. It’s unexpected to say the least, especially given the political climate: a pop-up exhibition in a politician’s office. But Walton MP Dan Carden has been working with Dead Pigeon Gallery in order to facilitate a three-month takeover of his office – as part of the Independents Biennial. 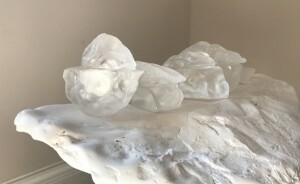 A rare insight into how art can respond at the site of local politics, expect new works by photographer Jane MacNeil, landscape architect Andrea Ku, textile designer Catherine Dalton, sculptor Louis Jeck Prestige and more. See it until 26 July.